Corporal Vasilov moved his hand over the control surface and twisted his wrist slightly. The massive metal frame he was commanding deftly stepped over the fallen soldiers in front of it and bounded forwards. He wanted to push his advantage and pursued the remaining Children of the One True God soldiers with a grim determination. His HUD warned him that his own Coyote Assault Troopers were approaching from the right and so the unit of fleeing Speakers would be forced to pause their retreat in order to engage them. The Speakers had not yet spotted the Coyotes and so felt a moment of relief when they saw the hulking frame of the Kodiak slow to a halt and drop to its knees. A second later though they saw the Coyotes pause their own pursuit and take cover behind the rubble. The lead Speaker, a battle-hardened veteran named Liebowitz, realised that something terrible was about to happen, and looked over his shoulder just in time to see the stabilised Kodiak spin up its terrifying minigun and slowly strafe his entire unit. As the red mist that was once his fellow soldiers approached his position, Liebowitz barely had time to whisper a prayer to the Prophet before diving into the rubble to avoid being torn apart by the Kodiak’s fearsome weaponry. At last Vasilov powered down the minigun but remained motionless for a few seconds, surveying the scene to ensure there was no movement. Satisfied, he engaged the control surface again, raising the Kodiak up from its static firing position, and began walking back towards the main battle. Behind it, Liebowitz looked in horror at the patch of red ground where his brothers and sisters once stood mere moments earlier. He turned to regard the departing Kodiak, and thought that perhaps he had seen the devil himself. 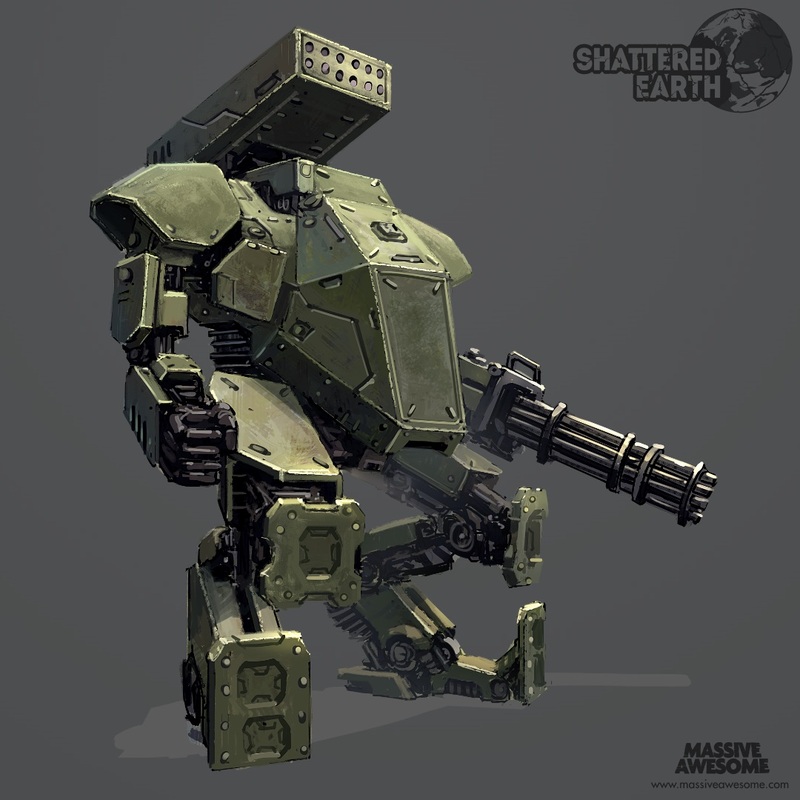 The Kodiak Tactical Heavy Frame (THF) is a mobile artillery platform, and the largest frame currently in production. The predominantly-Russian made unit represents the pinnacle of UNM engineering, providing mid-range fire support for UNM soldiers on the front lines, and packing heavy armour and high-impact weaponry for use against multiple different threats. The Kodiak is physically imposing at almost 12’ high, carrying more than a passing resemblance to the bear it shares a name with. It is often described as a ‘walking tank’, and occupies much the same role on the battlefield. Whilst tracked vehicles are still in use in some operational zones, the rugged terrain of 30 A.E. ensures that heavy frames like the Kodiak are in much more widespread use. Like most frames the Kodiak is bipedal; however, being a heavy frame, the pilot inside sits within an enclosed cockpit rather than providing direct limb control as with light and medium frames. The cockpit itself is housed within the enlarged chest cavity, with a series of external cameras providing a 360 degree viewport for the pilot. Piloting a Kodiak is a complex operation, akin to the jet fighters of the previous age. An in-built Static Intelligence (SI) controls most of the more complicated functions of the frame’s multiple systems, with the pilot free to directly control the movement and weaponry. Targeting systems provide all-around coverage, and are able to track high-velocity targets. The frame itself is surprisingly agile, with a rotational mount at the waist allowing the torso to spin through nearly 270 degrees when the legs are planted. Weaponry varies as the Kodiak can be modified to suit the engagement, with hard-points built into the shoulders and along the length of the arms. 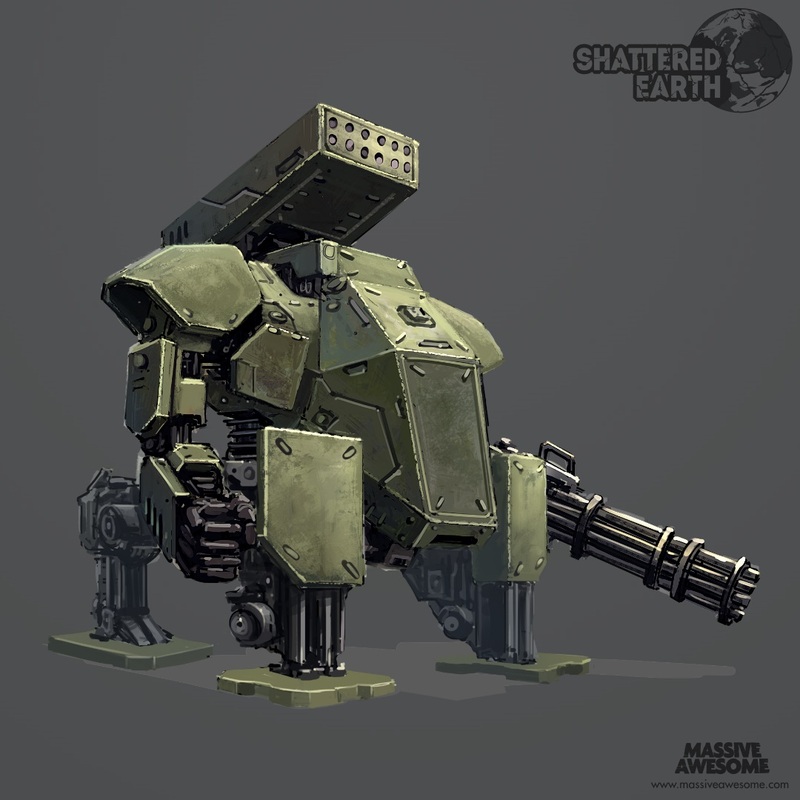 Most are equipped with arm-mounted miniguns for mid-range anti-infantry, and top-mounted micro-missile launchers (called MIRVs) for anti-armour and long-range threat elimination. The thick armour of the Kodiak can withstand almost all projectile weapons, and is insulated against extremes of heat and cold. The outer casing also provides some protection against EMP attacks, although the SI is still susceptible to enemy hacking. To combat this, the SI is protected by a high-level firewall and low-level intrusion counter electronics (ICE).